Liu An tea originates from An Hui province but it first gained popularity in Guang Dong province after a Chinese doctor served it as a medicinal tea to cure heatstroke and stomach ailments in the Ming Dynasty. Because of its medicinal properties, it quickly gained fame and spread throughout China. While it is technically not a Pu-erh tea (due to the material used), the post-fermentation processing is very similar. Like Pu-erh tea, Liu An tea gets better with careful aging. The taste of this tea resembles that of a green/raw Pu-erh but is somewhat sweeter. After a few sips, the sweet aftertaste will linger on in your mouth. Good for multiple infusion. Le rapport qualité-prix est excellent! Un thé de tous les jours... Quand les jours sont bons. Problably the best everyday-tea i´ve tried.Full aroma and sweet aftertaste;in general it is more similar to a lung ching than a pu´er.It is definetly a good surprise,i´ll buy some more! An interesting tea, although it would not be an everyday drinker for me. Aroma of waxy chocolate. Taste is medicinal and not as earthy as puerh. Different enough that it´s worth a try. This is my very first purchase from Teaspring.com. I am very satisfied with the shipping i must say it didn´t take an excessively long time to come to the U.S. I purchased two teas. The one i have just tried is the Liu An. It´s Tea leaves have a very strong earthy smell, though pleasant. I adore the beautiful warm orange-amberish color. Its a very light and smooth tea. I personally really love that. I also tried it with a small amount of sugar. Which is also nice. Both ways are delicious! I will be shopping here more often for my tea. I highly recommend this tea for those just getting into tea or prefer a lighter tea. I also recommend quickly "rinsing" the tea leaves on the first first infusion and discarding it, to eliminate any unwanted bitterness. I just like this tea, it is so unique in its complex flavor. Excellent, very good value and a very pleasant tea. Quite similar to green puerh but sweeter, and a very pleasant looking liquid. Highly recommended for anyone looking for a softer sweeter version of puerh. Just the right tea on a dark and wet autumn afternoon. It lifted my spirit and lessened my migraine. The taste is so nice and lasting and the color a delight to look at, a clear reddish. This tea reminds me in taste very much of Long Jing Huang Pao yet an idea milder if brewed the same way. However, LJHP is more tolerant to long steeping. A good tea so. 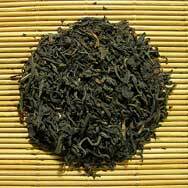 just recieved order, was a refined scent of dark chocolate and ash, taste was medicinal but soothing, a fine tea. This tea tastes rather medicinal, but it does enliven my spirits and clears the head. It also has a faint dusty quality. The tea isn´t overpowering though. tasted very light and tends to bitter when too much leaves are used. a nice light floral bouquet. hard to define the taste unlike other green pu er. A mild and tasty pu-erh tea, unique and refreshing. All of the teas I have tasted are consistently good. I recommend this company for China tea. Syrupy sweet flavor with hints of malt up front, followed by a sharp, almost fruity taste. Dry, earthy aftertaste. Baked chocolate aroma from the leaves and cup. An unusual tea and a good value. Works well for gongfu brewing. I am delighted with delicious tea, and with all the teas I ordered. I highly recommend TeaSpring for anyone who would like to purchase tea from mainland China. The teas arrived in very lovely packaging, which were clearly marked by product in both English and Chinese---delightful!!! I ordered two of many of the teas to give as a birthday gift to my brother who has been drinking Chinese tea for 30 years. He is very happy with the gifts. 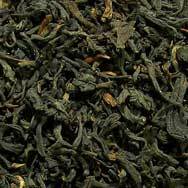 Good bargain-priced pu-erh tea. A strong robust brew with that usual "earthy-dirt" pu-erh scent. Although the infusions are strong, they are smooth and slightly sweet. If you are not using a yixing teapot, I highly recommend quickly "rinsing" the tea leaves on the first first infusion and discarding it, to eliminate any unwanted bitterness. Was confused when found that it was rather green and raw than fermented. It´s an interesting tea. Lasts for multiple infusions. Makes a good drink! One of my first 2 orders from this site. My first try of Liu An-new and nice. Somelike honey taste which i like. Relatively good compared to the price. Nice and sweet caramel like flavor. But so good that its in in my standard puerh gottohavelist. Correcte Pu-erh voor alledag. Goeie kwaliteit/prijs verhouding. Verleidelijke neus van chocolade en snoepgoed doch niet al te zoet in de afdronk. I really like this tea! It´s the only liu an I´ve tried, and I´ve heard that there are some not-so-good ones out there, but this is really enjoyable. My second shipment. The price is great too. This is a nice tea.. and great for the price. I don’t think of it as a pu-erh though -- it tastes more like a dragonwell green tea to me, bright and lightly sweet. I can also taste the "damp stone" notes that others have mentioned -- it’s quite a transporting flavor, brings me to a rainy day in the countryside. I like the smell of the dry tea leaves but still don’t enjoy drinking it... maybe I’m just not a Pu-erh fancier. Nice rust colored liquor. Someone else here described something like damp stone in the flavor. I’ll agree with that. I wonder what medicinal qualities it may have. Interesting. Interesting aged tea--not quite the same as pu’erh. A good tea, I didn’t find any unpleasant taste or aroma in it and it is a nice tea to drink. Lasts a normal number of infusions. The slight bitterness is an odd character, but each tea has to be different. Quite earthy but nice to drink, relaxing. I would recommend this tea. I’ve always felt that the smell of pu-erh tea in general reminded me of barnyard animals. This one reminds me a bit more of the actual barn though. A sort of barn all full up of hay that is soft and nice to lie on. As for the taste I fail to find the ’dust and dirt’ that other more negative reviews have described. I’ll stand by my claim that it tastes like summer gone by. Very nice. I have been very surprised by this tea. I thaught it was a Pu-ehr that taste as another one. it is not the case. the taste is like a dampness stone with earthy fragrances. It is a strange, magic and good tea. Good tea, but very specific. Some may even hate it. Old taste. Someone out there must like this style but not me. This tea obviously has the "beet" note, as others have described this style of tea. It also has some sweetness but there are hints of dust and dirt in it that I don’t care for. I liked this one better when I steeped it cold. Steeped this way, the unpleasent qualities diminished. This tea has a rather strong dry smell. When infused it gives a beautiful strong, clear classic tea colour and a rich flavour that lasts for multiple infusions. It also leaves a lovely taste in your mouth when you finish the cup. A tea I think I’ll keep coming back to. Very good tea. I love it. This Liu An Pu-erh Tea is very good!!! I find it smooth, and has no bitterness, only great taste. I plan on buying more of this wonderful tea!! !